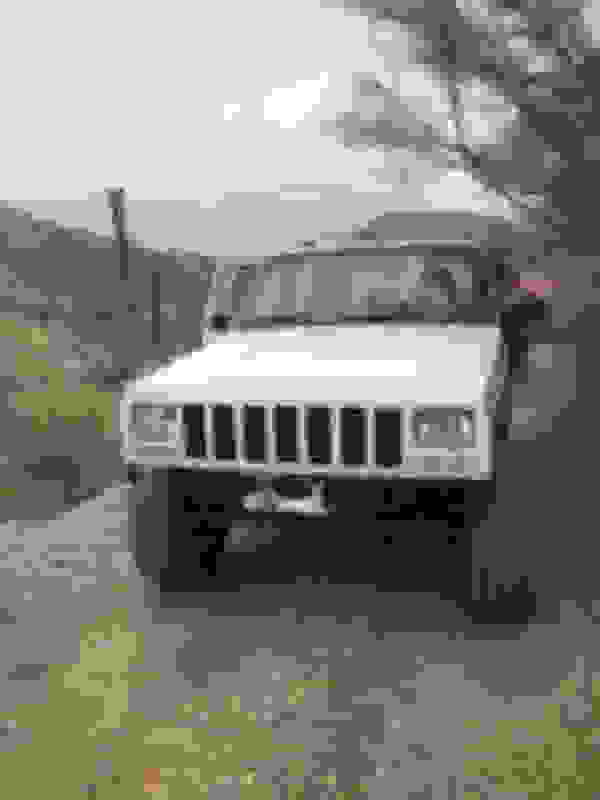 2001 XJ, 4.0, manual transmission, 4.5" lift, 3.55 gears (I'm aware that 3.55 gear is "shallow" for 35s, but I'd like to keep my highway RPM down. I plan on installing an NP231 based doubler to get 7.34:1 double low range and long term I have an LS1 sitting in the garage to swap into the vehicle)... ignore the lack of bumper, I'm still in the process of designing/building my winch bumper. I'm currently running Rubicon take off 32" (255/75R17) all terrain tires and they have served me REALLY WELL! However, I'm starting to go with more people who go down trails that need a bit more clearance (I clicked my front bottom of my diff on a rock last go... no damage, but still a consideration). So while I've still got some life left in the 32s, I'm feeling it's time to start thinking about 35s (easier to watch for deals). I'm currently running the Rubicon 17" aluminum rims (using adapter spacers), but want to get rid of them and go to a steel rims. I was initially inclined to stay with 17" rims as my XJ has WJ knuckles, however it seems that everything in a 17" size is an E rated tire and thus quite stiff. If I go down to a 15" size, I can get things in C rating and thus would both ride softer and flex (and grip) more over rough terrain. I have read that I can go down to 15" as long as it has no more than 4" back spacing (3.5" preferred). I daily drive my XJ (to work, to the store, pick up the kids, etc... around town, 80mph on the freeway, etc. ), so I would say I need to stay in an all terrain "style" tire (not that it has to be specifically labeled an all terrain tire). I'm not **** about noise (my XJ has no rubber/all spherical bearings in the front suspension), but gas mileage is a consideration (both cost and the ability to travel longer distances to get places). The wheeling that I (and the people I go with) do is your standard AZ, back country wheeling (dirt roads, rocky jeep trails, etc.). It's not like we get much rain, so mud isn't an issue. So (sorry for the long rant), what do I get? Bfg ko2, cooper at3, and general grabber at2 are what ivwoukd consider the 3 best all terrains on the market right now having worked in the industry for the past 7 years and getting numerous reviews from customers, trying them all out, and attending many events....the hybrid line of tires are a big craze and may be aomething that interests you. That is half all terrain half mud tires. The wrangler duratrac is a top choice. What's better, the all terrain (lets say the KO2) or the hybrid (the duratrac)? the duratrac is awesome offroad but has weak sidewalls that are prone to puncturing on rocks or roots...the ko2 excels at everything but mud. Just depends and what you are looking for..if you dont do mud, i would go ko2 just for better characteristics on road and longer life span. It sounds like the KO2 is much better for what I need. Everything I do is sharp rocks, so having the stronger sidewall is a big bonus. What about the load rating issue? The KO2 in a 15" rim version is a C, while it's a E rating in a 17" rim version. Which would be a stronger (take more abuse) tire (or does the load rating not impact that)? Edit: just checked and the Wrangler SR-A 255/75R17s I have are an SL rated tire. Last edited by CLSegraves1; 07-25-2018 at 04:18 PM. Cool. I'm running the later Akebono calipers and I have 7/8" rod ends (in place of tie rod ends). How would the rim rub when the wheels are turned? The rim is fixed to the hub and therefore shouldn't change it's relationship to anything once bolted on. edit: oh wait, you are talking about the steering links right? Based on all of the criteria you have mentioned IMHO I would regear before going to 35’s . You mentioned you need good highway manners and fuel mileage. With 3.55’s and 35s you’ll constantly be in the throttle. When you turn the wheel, even though the tie rod stays parallel to the axle housing, the angle of the tie rod relative to the steering knuckle swings out. That is the biggest reason they used 16" wheels. Quick Reply: 35" Tire Suggestion?